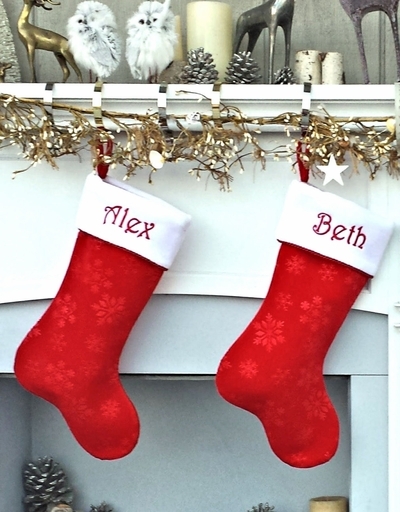 Personalized Stocking - Great Christmas Stocking made from velvet at a great price - red velvet body with etched snowflakes, white velvet top, trimmed with gorgeous red metallic twist tope. Perfect for embroidered name. Names can be personalized on the cuff of this Christmas stocking with RED, Green or GOLD metallic embroidery thread to compliment the stocking.... personalization is free of charge. MATERIALS: Velvet, Satin Lining and Metallic Twist rope embelishments. SIZE: 19" Diagonally from the top left corner of the stocking to the toe of the stocking. Top cuff width is about 7"
LINING: This stocking is fully lined inside in satin and padded to achieve the proper classic high end look and feel. Heirloom quality ! We have a sample picture of the stocking monogrammed with gorgeous embroidery thread ... click on the thumbnail image in the top right hand corner of this page to see a larger version.